PACEMAKER, BELFAST, 7/7/2018: Gardai at the scene where William Dunlop suffered a fatal crash during practice for the Skerries 100 today. Northern Ireland- 13th August 2014 Mandatory Credit - Matt Mackey/Presseye.com William Dunlop in action on board his superbike at practice for the Dundrod 150 and Ulster Grand Prix road races. William Dunlop and his partner Janine arrive at the Adelaide Motorcycle Awards in Belfast in 2014. PICTURE BY STEPHEN DAVISON PACEMAKER, BELFAST, 17/1/2014. @Press Eye Ltd Northern Ireland- 3rd June 2013 Mandatory Credit - Brian Little/ Presseye William Dunlop (Milwaukee Yamaha) at Creg-Ny-Baa during Monday's Royan London 360 Superstock Race over the Mountain Course during the IOM TT 2013. Northern Ireland- 13th May 2014 Mandatory Credit - Picture - Matt Mackey/Presseye.com Vauxhall International 2014 North West 200. Tuesday practice. William Dunlop Tyco. ©Press Eye Ltd Northern Ireland 26th April 2013 - Mandatory Credit - Picture by Matt Mackey/presseye.com Cookstown 100 road races practice evening. Ballymoney rider William Dunlop. Sunday Life columnist and former mechanic of William Dunlop's dad, Robert, Liam Beckett has paid a heartbreaking tribute to the legendary road racer following his tragic death at the Skerries 100. 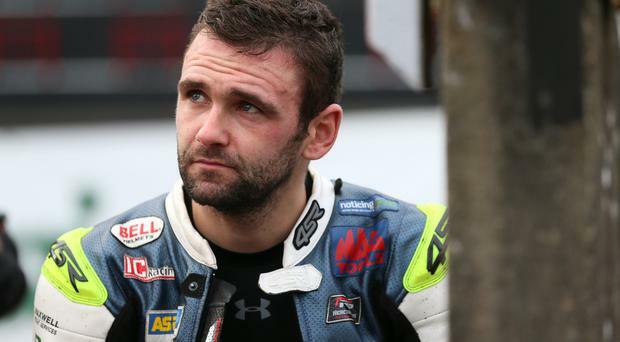 Tragedy struck the Dunlop family for a third time on Saturday when William Dunlop was killed in a practice run at the event in Co Dublin. Following consultation with the riders, it was agreed the overall prize fund for the event, which is going ahead as planned on Sunday, would be given to the Dunlop family. The son of the late Robert and nephew of the legendary Joey was making his return to the sport after pulling out of this year's Isle of Man TT to be with his pregnant partner. His death has stunned both road racing fans and the public who knew him as a fierce competitor yet a gentleman off the track. Liam Beckett, speaking to the Sunday Life, said: “I pray for the family and my thoughts are with his partner Janine, daughter Ella and their unborn child." “I don’t say this lightly. William got to the top of his profession in road racing not because he was a nephew of Joey or the son of Robert, but because of his own talent and ability. "But my relationship with William goes beyond the sport of bikes. I enjoyed playing golf with William regularly and he was such an unassuming lad. I made sure that when I picked the players to play with us in our fourball, William would always be comfortable. Can I just say a massive thank you to the 100’s of people who have been in touch with me by calls, texts, emails, tweets etc regarding William, too many to reply to individually, but neither I nor Williams family will ever forget your kindness. Like so many I am heartbroken. Tributes from across Ireland and indeed, the world, have been flooding in flowing William's tragic death. Road race champion Ryan Farquhar said: “I’m absolutely gutted. We all feel the hurt for the family. It’s another sad day for road racing. DUP MP Ian Paisley Junior told the Sunday Life William “represented the past, future and present of road racing and he has left a legacy which he can be immensely proud of. William was an absolute gentlemen. There was no showiness with William- he just got on with the sport he loved. Sadly, accidents are part of the sport and we’ve lost William." On Saturday night, DUP leader Arlene Foster was among figures in Northern Ireland who reacted to the tragic news. Shocked and saddened by the passing of NI’s talented sporting legend, William Dunlop. Motorcycling was his life and he will be forever remembered for his many achievements, both in Ballymoney and across the world. Truly terrible news reaching Ballymoney tonight, from the control room our thoughts go out to the Dunlop family circle and everyone affected by the sad news about William. This is truly shocking news once more for The Dunlop family circle , Northern Ireland and the Road racing fraternity. Sincere condolences to William's partner and daughter. Awful news about William Dunlop. Another tragic loss for the Dunlop family. Condolences to sorrowing family and friends. We are so saddened by the terrible, tragic loss of William Dunlop. A brilliant sportsman - but above all a sweet, kind man. A gentleman. A friend. Our thoughts and deepest sympathies are with his family. The Police Federation has condemned a "sick and depraved" statement by a dissident republican group blaming the murder of Lyra McKee on police. By Mark Edwards Thousands of pounds have been raised in memory of investigative journalist Lyra McKee who was murdered at the scene of rioting in Derry. Northern Ireland political leaders have joined together to condemn the killing of Lyra McKee on the streets of Londonderry during rioting in the area.